I have been fascinated about the antique colour photographs taken by Russian photographer and inventor S. M. Prokudin-Gorskii a century ago, since I first saw the online exhibition The Empire that was Russia. A few years ago, I downloaded and restored some of those photos, but then stopped doing that and concentrated more on my own photography. Recently, I decided to continue this project and added about 20 new restorations to Prokudin-Gorskii gallery of my new website. Here is one of the latest restorations and one of most difficult I've done so far. (Click to enlarge). Not only was the original badly damaged, it also had heavy vignetting on the top, which occurred when the photographer used camera movements to correct perspective. The topmost cross was on one plate only, so I had to actually "repaint" the sky. 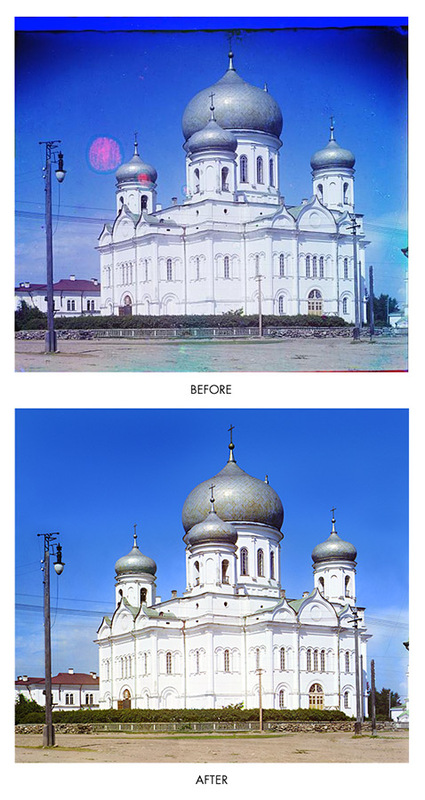 While colour rendition is subject to artist's taste, I can tell that technically my restorations are better than those done by the Library of Congress, even those done manually not to mention computer generated. When restoring manually, they mostly left the blue channel intact, and I correct defects in all channels. I am going to upload at least a couple new images per week, depending on how busy I am, so please check my gallery from time to time. Later I hope to put together a book of PG's photos and make it available for online purchase. Hi there, I saw your blog post on the web. 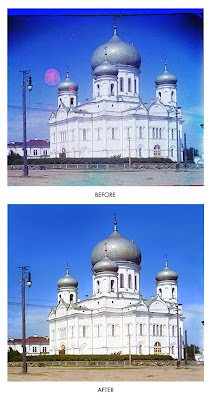 Image restoration is one of the great way to store your old photo's by using photography technology. I think it is the best way for restoration.